Note: This is not an official Stack Exchange post. I have changed some aspects and addressed some concerns. Please read the post again if you have read it previously. TL;DR: I propose that community members develop an open-source alternative for Area 51 that will eventually be used by Stack Exchange. But please read the full post. Area 51 has been churning out progressively weaker sites [...] about a third of which fail in private beta. There were plans to create a new site (called "Area 52") with a different process. But no major changes to Area 51 except for a drastically reduced time needed to pass a proposal have been done. Whilst previously succeeded one proposal every month (approximation), noonly one proposal has made it to beta for almost seven months now. The failure component seems to be the commitment stage, in which the committers with high reputation on other sites was the largest hurdle. 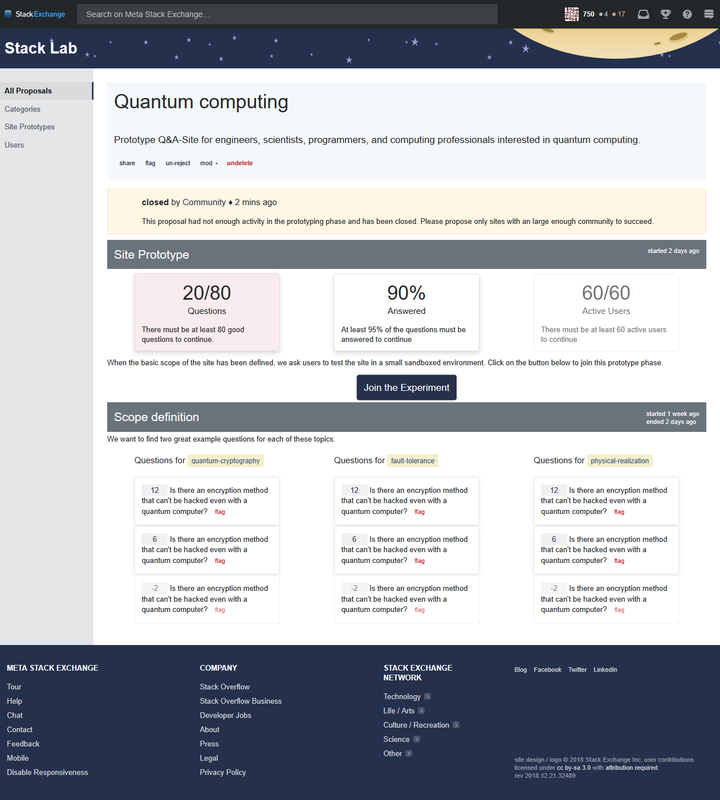 Unfortunately Stack Exchange does not seem to have any resources to develop a new site staging zone. 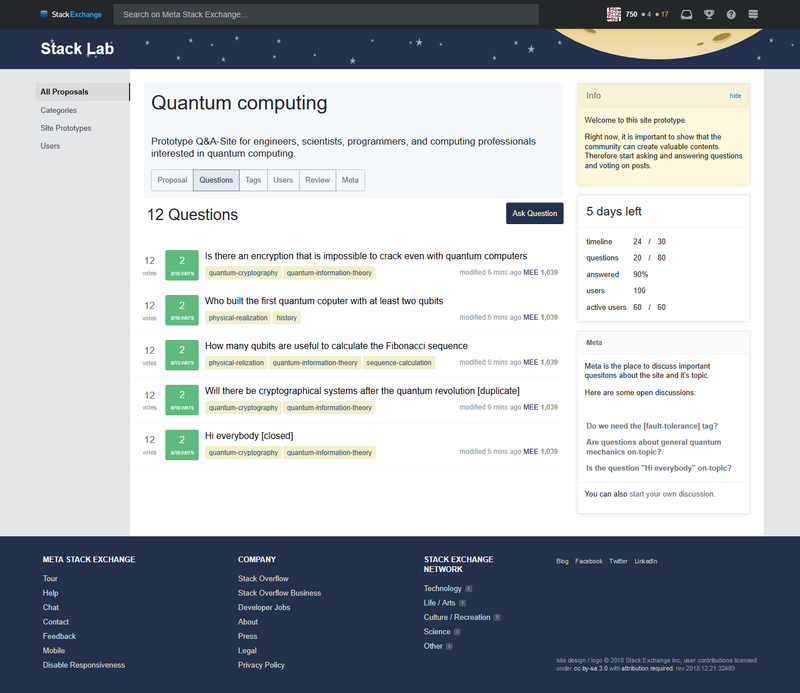 I think this is a pity, because the Stack Exchange system is really good for Q&A. I have thought about how Area 51 could be improved and used some of the statements from Robert Cartaino as a starting point. I am not sure whether these changes will be sufficient to un-flaw the site creation process, maybe one of the community managers (CM) can comment on this. Anybody can propose a new site. Each proposal consists of a site name, an audience string (site for ...) and an community description (we are ...). At the end of this prototyping stage (if some health conditions are met) the public beta starts. This system is intended to lead communities that have not so much knowledge about Stack Exchange and therefore making the "experienced users" factor less important. Also the system could theoretically be extended to allow "Community Guides" to be appointed, experienced users that help (together with the CMs) new sites to succeed. I propose to do it as an community project. That’s right. I propose that committed members of the community help to develop an open source community building tool together. It would be published on GitHub with an permissive license as MIT, etc. Ideally one of the CMs would help us with ideas and maybe some of Stack Exchange’s developers would join the development process too. This post is intended to solicit consensus about whether this type of community project is generally a good idea. Comments on the proposed implementation are also welcome. What would SE need to do? 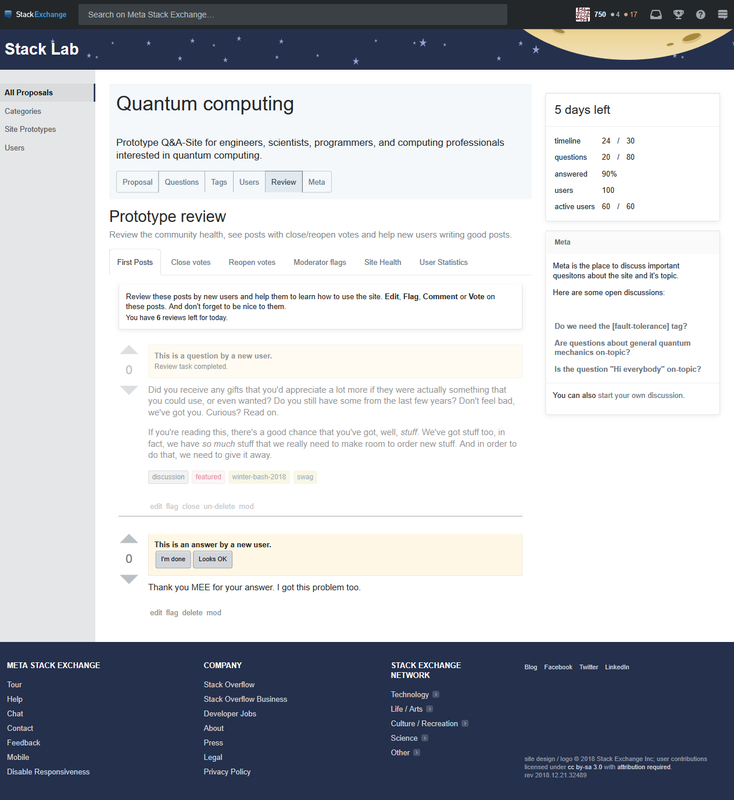 Stack Exchange would need to do two things only to support the creation of this project: They need to tell us what is important to them for such a site and they need to run the (final) version on their servers and use it as a replacement to Area 51. Additionally Stack Exchange could support us by providing us a chat room or even creating a team for us to develop this. Maybe some of their developers join us and help with the development, but only if they want to. What technology should be used. As Journeyman Geek said in a comment: Stack Exchange will probably not run a site not built on their software stack. I don't think this is a problem. For example the data explorer is also an open-source project running on Stack Exchange servers. But wouldn't this process make it way easier to create new sites and therefore lead to segmentation and struggling/low-activity sites? All proposals would still have to be reviewed by the Community Team or maybe even the Community Guides when they are close to the next stage. Furthermore proposals would still have to fulfill both minimum quantity and quality requirements in prototyping. These requirements would be enforced by system requirements and staff intervention. And don't forget: Launching a full public beta site (or private beta if it is not removed) will always be a manual process. I think there could be a selection ("Would you sponsor this site?") that allows potential sponsors to quickly and effectively communicate with Stack Exchange. This may or may not result in less hard requirements for the Prototyping stage. I am not fully convinced whether or not this should happen. There are arguments for both sites (they want to pay money and have therefore probably enough users vs. only because a site is sponsored it should succeed and not fail the usual review criterions). FIFTY users commiting as community members. This should probably include only upvoted and open questions to limit abuse. Somebody thinks they have an audience and proposes a new SE site with a title and a tag line. Users can subscribe/follow proposals. As per current Area 51. [NEW] This audience tries to agree on three main topics (tags). The topic suggestions can be voted on and there is a limited time in which a consensus must be reached. For each of these three topics must be found two (or more) example questions. These must have a minimum score. milestones are five users and five questions after three days, and ongoing activity of at least one action per seven days. require a consensus of five topics represented by five tags within three days of proposal. each tag requires a minimum number of open, upvoted questions within ten days of proposal. require a minimum number of followers. these topics/tags must be absent from an existing SE site, or any overlap must be excused by good reason. [NEW] When these questions are found in time and there are enough followers, the site experiment starts. All users that ever participated in this process and users that subscribed to the site are invited to test the site in an sandboxed environment. The example questions are automatically imported and there is a mini-meta allowing users to find consensus on topic-issues. the Definition phase is complete when reaching 60 followers and 40 questions of score 10+. the Commitment phase is complete when reaching 200 followers, of whom 100 have the association bonus, and a minimum commitment score is reached (determined by a formula). this stage should merge the current Definition and Commitment phases, and be public. the mini-meta should exist from day zero, and used as the place for developing initial consensus on tags. include increasing milestones for number of users, number of topics/tags, number of tags with a minimum size, number of questions, which apply at regular intervals. move to private beta when the requirements are met. [NEW] The system will automatically appoint three users as moderators for the site (they need to agree to this of course) after one week. moderators pro tem are selected from the followers who are experienced elsewhere in the Stack Exchange network when the public beta begins. moderators are not necessary until the community is established. Avoid selecting moderators until the public beta (see below) and avoid selecting them automatically at all. If there has not been enough activity in the experiment after two weeks: The proposal is closed and the experiment site locked. Otherwise the current site process from beta to graduation (private-beta may be excluded) will be followed. the proposal has four months (~122 days) to complete Definition and a further four months (total ~244 days) to complete Commitment. an overall time limit of 180 days is allowed for the Experiment (combined Definition-Commitment) phase. the private beta stage is disestablished as a hindrance to growth. requirements to enter public beta are approximately those currently used, in addition to clarifications of the scope. initial nominations for moderators are made by a community manager simultaneously with the change to public beta. Nominees accept or decline, the community votes. Nominees gaining a minimum level of support (e.g. at least 30% of users voted them) are established as moderators; any unfilled spots are decided by the community manager. Not the answer you're looking for? Browse other questions tagged discussion area51 community private-beta .